A Powerful and ferocious film, the movie about these two men and their father is compelling, but the fights in the second half tend to drag on just a little too long. 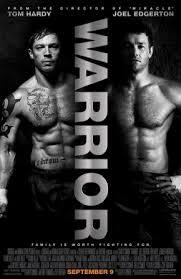 Warrior is a very entertaining movie. It doesn’t seem like it would be anything special on the surface, simply because it is about two brothers fighting it out in the ring, for an ultimate fighting championship competition. But the movie around that and leading up to it, about who these men are and what they have been through is what makes the whole thing so worthwhile. In fact, the actual fighting in the ring business makes up the worst parts of the movie. Not that there’s anything so bad about them, but it’s just that the story about how these guys got there is so much more interesting. At the start of the film, we meet Tommy, (Tom Hardy), returning home to his father’s house after being away for years. He left under pretty bad circumstances, with his father, Paddy Conion (Nick Nolte), being an abusive drunk who made life torturous for Tommy, his other brother, Brendan, and their mom. Tommy left with his mom, ran away, and planned to never come back. Then Tommy’s mom got sick and died and Tommy went off to war. Now, he’s back home to confront the life he left behind. When Tommy enters his father’s home for that opening scene, he sits down with the old man and wants to have a drink with him. Only paddy refuses, saying he’s sober now. This infuriates Tommy, who remembers all the terrible times and can’t believe that now is the time his father chose to quit. He could have quit when Tommy was a boy, and made life easier for him. He could have quit while Tommy’s mother was still around, and maybe the family would have stayed together. But now, when the father is living alone and has nobody to take his anger out on anymore, now is when he decides to quit? To Tommy, this seems like the most selfish act of all, like his father wouldn’t quit for anyone else, but will only do it for himself. Despite having this anger, Tommy goes to the gym, sees that he’s got some fighting skills, and decides to ask his old man to train him. Paddy gladly accepts, if for no other reason, than because it means Tommy will be putting aside his anger and differences about what went on in the past and will be letting his guard down. That’s about the time that we meet Brendan, who is really the lead character of the movie. 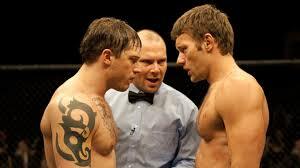 Brendan (played by Joel Edgerton in his breakout role) is a schoolteacher and a family man. He is the last guy you expect to see stepping into the ring, and yet he doesn’t really have a choice. Brendan needs money bad. The bank is about to foreclose on his house unless he can come up with a certain amount fast. Brendan tells his wife that outside of teaching, he has a night job working as a bouncer outside of a bar, only he’s really sneaking off to strip clubs with the ring in the back for some fights. When she catches him, he explains to her that he can make about ten times as much money with one fight than he could as a bouncer at a bar. It’s one of these fights at a seedy, underground location that gets Brendan fired from being a teacher. I really like that the movie shows Brendan at his school job in detail, first showing him in the classroom teaching science, then showing him come in the day after the fight with the kids asking questions about it, and finally showing what happens when the superintendant finds out about the fight. Brendan meets with the principal (the always reliable Kevin Dunn), and asks the principal how to handle the superintendant. We don’t actually get to see Brendan sit down with the superintendent, and that’s a shame, because it is the only big scene missing from the storyline. I suppose it isn’t really necessary, since we clearly learn the result, but still, it would have been interesting. What we do get to see is the scene where Brendan finds his trainer at a gym. Just like his brother, Tommy, asking his father to train him because the two of them have a history together, Brendan also goes to a guy from his past. This is Frank Campana, (played by Frank Grillo), an actor who has really been stepping it up lately. He takes supporting roles, like he did in the grey, playing the antagonist to the crew of survivors. Here, he plays the guy in Brendan’s corner who offers words of wisdom, starting with him telling Brendan that the whole idea is ridiculous and that he shouldn’t even think about it. Of course Brendan doesn’t listen, and soon frank is training him. Some of the more interesting moments are the ones that occur between the two brothers. Maybe that’s in part because there are just so few of them. Call it the law of supply and demand, the less we see of something, the more we want it. These two guys really only have one scene together, other than the big fight at the end. Aside from this one scene, there is also a snub scene where Tommy basically ignores his brother when the two of them are in close proximity to each other in Atlantic City for the big fight. But their one scene together, in which they finally reunite prior to their fight, is a pretty good one. It’s during that scene that some things about their past and how they dealt with their father finally come out and get thrown on the table. Tommy is angry with Brendan. He doesn’t like that Brendan stayed, when Tommy and his mother fled town. He feels like Brendan betrayed them, choosing his father over them. Brendan tries to explain to Tommy that it wasn’t his father who he chose; it was the girl he was in love with, who lived in town. This is the girl Brendan ended up marrying. On top of that, Brendan thinks Tommy is being ridiculous saying that he is the traitor, when Tommy is the one who has hired their father as his fighting trainer. By the end of the movie, we get a series of big fights. You knew it was coming, and the movie doesn’t hold back. It’s all pretty detailed, and maybe that’s what the problem is. The fights seem to go on for too long. This isn’t just Tommy fighting Brendan, but all of the other fights that lead up to it. In the usual big fight in the ring movie (from Rocky to Bloodsport), you get the big fight, and maybe a few other ones featuring the hero. In this movie, there are two heroes, and so we watch each one of them in all of their fights leading up to the big one. It’s a little much. Even still, the movie is enjoyable, and the deep story that led up to this was great. I love what happens to Nick Nolte and where his character ends up. The movie makes some bold decisions, such as what it does with his character, and they really make this a different kind of film, handled with some very smart and creative choices.